The Kremlin has lavished praise on the world-famous Russian cellist and conductor Mstislav Rostropovich, who is celebrating his 80th birthday. President Vladimir Putin is hosting a reception for him on Tuesday. He said the musician was not only "a brilliant cellist and gifted conductor," but also "a firm defender of human rights and freedom of spirit". 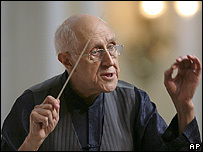 In the 1970s Rostropovich lived in exile from the then USSR. He returned in 1991, when communism had collapsed. He had defended the dissident writer, Alexander Solzhenitsyn, from official criticism in Soviet times. Rostropovich had to go into hospital last month. Russian media reports speculated that he was having treatment for cancer. President Putin visited Rostropovich while he was convalescing and last month awarded him Russia's "Order of the Fatherland, First Class".